Do you love your music but don't want to disturb those around you? 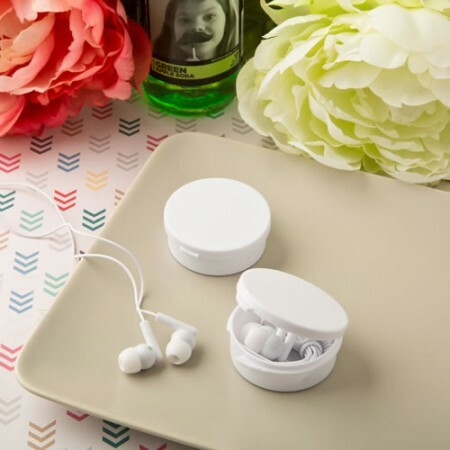 Use these fabulous little ear bud headphones and enjoy perfect sound quality! From our Practical Technology Favor Collection, we offer you a fun gadget for techno-savvy people. Our ear bud headphones are made from plastic with silver metal plugs and are covered with a soft white ear piece that fits comfortably into the ear. They come in a neat white plastic storage case that is ideal for travelling, slipping into your pocket, handbag or backpack. These ear bud headphones are the ideal hands-free option for mobile phones and musical devices. Use when going on a run, a walk or just relaxing around the house. Your guests will be thrilled to receive this fabulous and useful favor at your next event! A great techno-savvy idea for mobile phones, music devices and more! SOLD OUT - will be in stock around Saturday 11 May, 2019.